Johann Gutenberg holds the distinction of being the inventor of the movable-type printing press. In 1455, Gutenberg produced what is considered to be the first book ever printed: a Latin language Bible, printed in Mainz, Germany. Born as “Johann Gensfleisch” (John Gooseflesh), he preferred to be known as “Johann Gutenberg” (John Beautiful Mountain). Ironically, though he had created the most important invention in history, Gutenberg was a victim of unscrupulous business associates who took control of his business and left him in poverty. Nevertheless, the invention of the movable-type printing press meant that Bibles and books could finally be produced in large quantities in a short period of time. 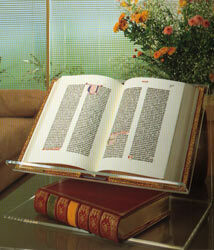 View Gutenberg Bible materials available today.